Do you understand that the God of the universe wants a relationship with you? I ask because this is important. In fact, it’s the key to bold, honest, fervent prayer. If you don’t believe that you need God, you won’t pray. If you don’t hunger for a relationship with Him, prayer won’t be important to you. If you hide in shame and think you’re too far-gone, prayer will seem unnecessary. But the reality is this: God wants to know you. He longs to listen to our quiet thoughts and bold requests. He delights in providing for us, protecting us, and hearing our cries. Even in our darkest moments, God loves to meet with us and nurture our hearts. We – as His children – just have to step up, step in, and pray. We have to choose to get over the barriers of our idols, our weakness, and our guilt. We’re told that we can “approach God’s throne of grace with confidence.” (Hebrews 4:16) So, why aren’t we doing it? For the next 31 days (but don’t stop there! ), I plead for you to meet with God through fervent prayer. When the promises of God become alive in our hearts & we’re trusting in His infallible Word, the boldness mentioned in Hebrews 4 doesn’t feel so unattainable. 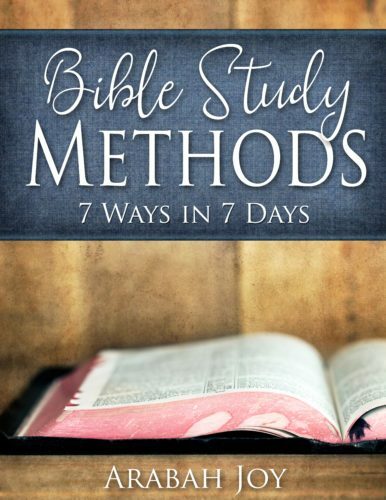 Dig into the Scriptures and search for a promise about the daily topic. Read the verses before and after to ensure you understand the context of the Scripture. Some days this will more difficult than others, but I urge you to search for a promise daily anyway. Where do you see yourself in the verse? Is the Scripture pointing out a weakness, sin, or strength? How does this Scripture speak personally to your season of life or your current situation? 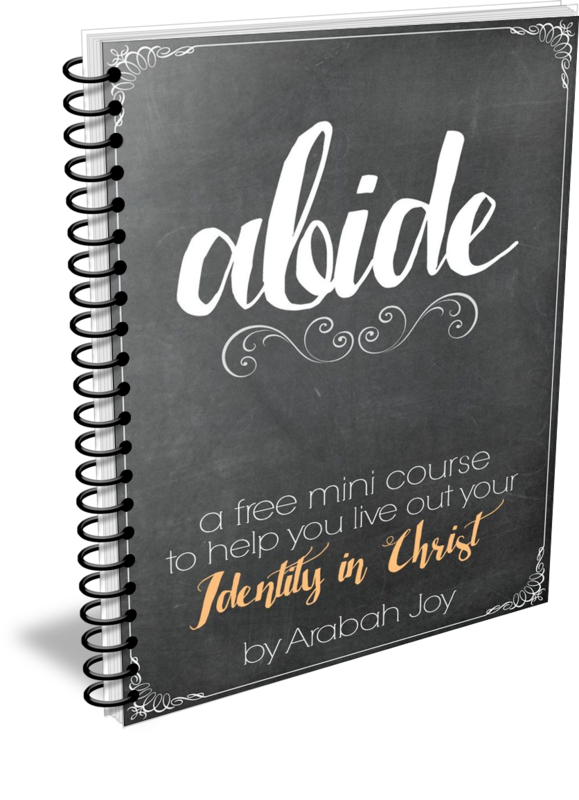 Make your prayers personal by identifying yourself in the Scripture passage. Simply come as you are – imperfections and all. God wants to meet with you, so present yourself daily to Him in love with honesty. He knows your heart already anyhow. So, choose to boldly approach the throne of grace. 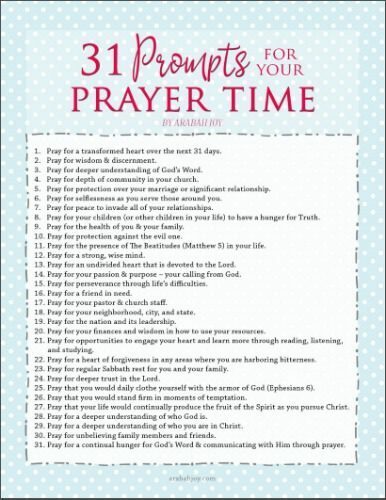 Click Here for the 31 Days of Prayer Prompts Printable Shown Above! Pray for a transformed heart over the next 31 days. Pray for wisdom & discernment. Pray for deeper understanding of God’s Word. Pray for depth of community in your church. Pray for protection over your marriage or significant relationship. Pray for selflessness as you serve those around you. Pray for peace to invade all of your relationships. Pray for your children (or other children in your life) to have a hunger for Truth. Pray for the health of you & your family. Pray for protection against the evil one. Pray for the presence of The Beatitudes (Matthew 5) in your life. Pray for a strong, wise mind. Pray for an undivided heart that is devoted to the Lord. Pray for your passion & purpose – your calling from God. Pray for perseverance through life’s difficulties. Pray for a friend in need. Pray for your pastor & church staff. Pray for your neighborhood, city, and state. Pray for the nation and its leadership. Pray for your finances and wisdom in how to use your resources. Pray for opportunities to engage your heart and learn more through reading, listening, and studying. Pray for a heart of forgiveness in any areas where you are harboring bitterness. Pray for regular Sabbath rest for you and your family. Pray for deeper trust in the Lord. Pray that you would daily clothe yourself with the armor of God (Ephesians 6). Pray that you would stand firm in moments of temptation. Pray that your life would continually produce the fruit of the Spirit as you pursue Christ. Pray for a deeper understanding of who God is. Pray for a deeper understanding of who you are in Christ. Pray for unbelieving family members and friends. Pray for a continual hunger for God’s Word & communicating with Him through prayer. 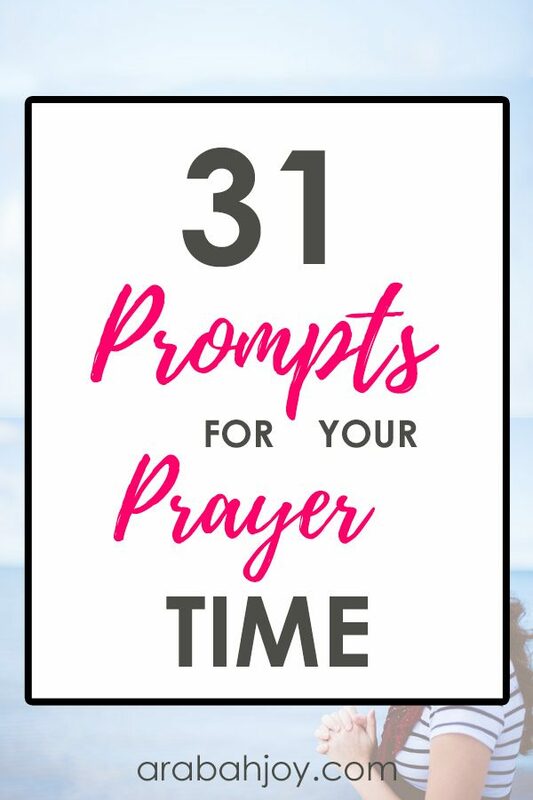 Click Here for the FREE 31 Prayer Prompt Printable! There is no right or wrong way to pray. It’s not important how or where you’re praying. However, it is important that you communicate with your Heavenly Father. I encourage you to carve out time daily to spend with the Lord. 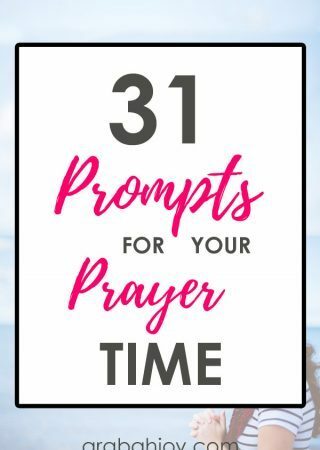 Search the Scriptures for truth about the daily prayer prompt and talk to God about that Truth. 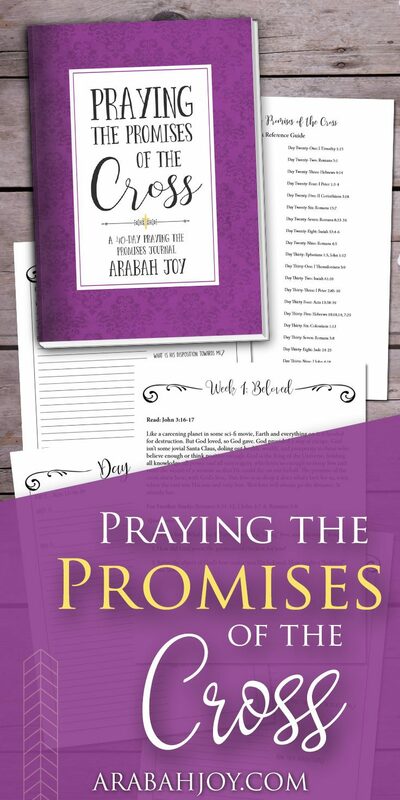 Begin today with a printable version of the 31 prayer prompts. And be encouraged that the God of this universe wants a personal, honest, engaged relationship with you. Alison is a wife, blogger, and Jesus-follower growing in grace & truth daily. She loves coffee in the morning, experimenting in the kitchen, and reading in a hammock just about anywhere. 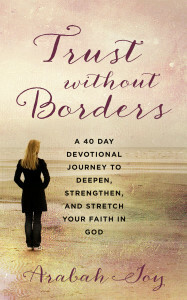 Her blog – AlisonTiemeyer.com – exists to encourage bold living rooted in God’s sweet gift of grace. You can also find Alison on Facebook, Instagram, and Pinterest. These are awesome ideas, Alison and AJ! So timely! Recently I’ve been feeling convicted about my lack of prayer. I could easily dig into the word, but I found myself not knowing what to pray and not being bold in prayer. I’m very eager to start this! I’ve written each prompt into my planner for each day. Thank you so much for this! I know this will be so transforming. Abbey, that is an excellent idea! I’m excited for the next 31 days for you. God longs for us to communicate with Him. He will meet you & bless your heart as you cry out to Him. Thanks for commenting!